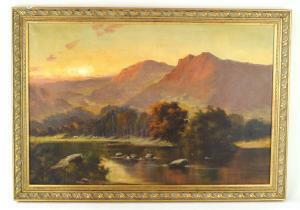 Find artworks, auction results, sale prices and pictures of Frances E. Jamieson at auctions worldwide. J M Ducker (aka F E Jamieson, 1895-1950) - 'Mountainous Lake Scene' Oil on canvas, signed J M Ducker lower right, approx 50x74cm, inset ornate gilt frame. 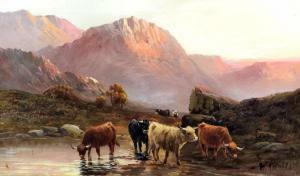 NB: F E Jamieson was an English painter who after holidaying to the highlands of Scotland became obsessed with painting highland landscapes and became one of the most prolific artists of his time. Jamieson became so fashionable that he was contracted to paint exclusively for various furniture stores painting scenes on furniture. Jamieson is believed to have painted under eleven different artists names so he could sell more of his paintings undetected by his employers. Some of his aliases include J. Mc Gregor, Graham Williams, Henry Stewart, H B Davies, W Richards, Aubrey Ramus. 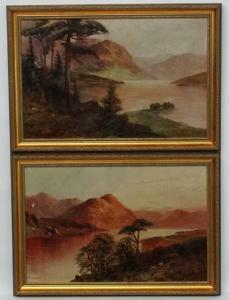 W. Richards (c. 1895-1950 ) Scottish School, Also known as Francis E Jamieson, Pair of oil on board, Mountains and Lochs, Signed lower left. 14 3/4 x 23 " CONDITION: Please Note - we do not make reference to the condition of lots within catalogue descriptions. We are however happy to provide additional information regarding the condition of items on request. 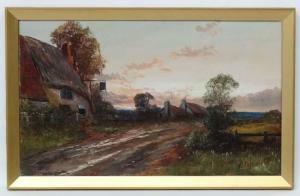 Frances E Jamieson (1895-1950), Also known as W Richards , Philps ,etc, Oil on canvas , ' Walton Village, Somerset ', Signed lower right and titled verso. 12 x 20". CONDITION: Please Note - we do not make reference to the condition of lots within catalogue descriptions. We are however happy to provide additional information regarding the condition of items on request. (1871; art market). As no information has yet come to light on the artist, it is unknown whether W. Richards knew Silva or simply emulated him. 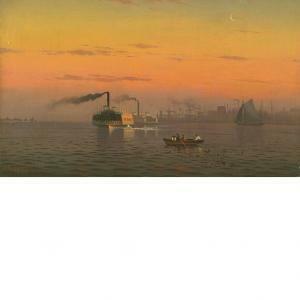 The painting, nonetheless, is filled with the stillness of Luminist light, expressing a calm, idealized vision of the Hudson River, as a place embracing both fishermen casting nets from small rowboats and steam-driven ferries. The image fits within an American pastoral tradition, incorporating industrial forms into optimistic and peaceful visions of the American landscape. Glue relined. Frame rubbing, with corresponding inpaint. Scattered craquelure throughout. Scattered inpaint throughout the sky, there is inpaint in the sails at the center right and in the smoke from the steamboats. There is a 1 inch vertical tear in the ships in the distance at the center. Thee is no further restoration visible under UV light.